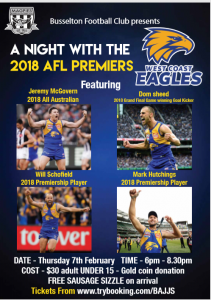 COME AND SEE FOUR EAGLES PREMIERSHIP PLAYERS UP CLOSE AND PERSONAL AT THE BUSSELTON FOOTBALL CLUB. INCLUSIONS: Sausage Sizzle on arrival and a great night out! !